The Strait of Georgia, part of the Salish Sea, is a beautiful and productive place. Our coastal waters support a diversity of species, rhythms of life, economies, and communities. However, we can already see that human-caused climate change is having negative impacts in the Strait of Georgia and its watershed. We know that climate change is real, we know that we are causing it, and we know that we are running out of time to stop it. Canada has made many commitments to slow and stop our greenhouse gas emissions, but we have missed each and every one of these targets. The 2017 country review of Canada, issued by the Organization for Economic Cooperation and Development (OECD), shows that the oil and gas sector is our largest culprit. What Can We Do Against Oil and Gas? If we create a green barricade of resistance to any further impacts from new fossil fuel projects along our coast we will be keeping tankers off our waters and helping Canada meet it’s climate commitments. There are legal options and levers of power to pull at different levels of government in our region – what we need are people to pull even the smallest of those levers. Right now, more than a dozen new or expanded oil, coal or liquefied natural gas (LNG) facilities have been proposed or recently approved on the shores of the Salish Sea, nominally aimed at exporting North American fossil fuels to Asian markets. These projects put our region on the front lines of the battle to stop climate change. Canada’s own communications to the UNFCCC confirm that the oil and gas sector keep our emissions high, and that we are on track to miss our next targets even taking into considerations programs that haven’t been fully announced as of March 2018. 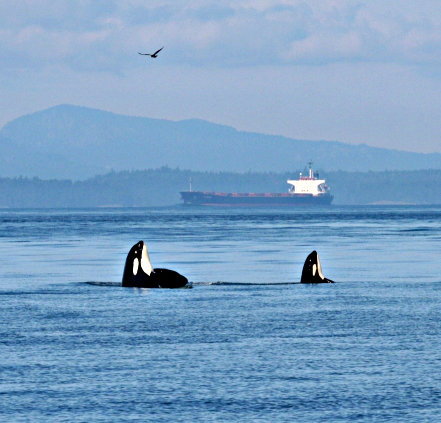 Over 308 million extra tonnes of carbon dioxide each year (more than 5 times BC’s annual total emissions), and 1,231 more ships joining the already crowded waterways of the Salish Sea are on the table to be put on tankers and into our atmosphere or put back on the wait list for locking into the ground. Georgia Strait Alliance is part of a coalition of groups, that are building the legal foundations and the community capacity to erect a green barricade. But we cannot enact a moratorium on our own. Our campaign is to build and use people power to say a definitive and legal “NO” to new fossil fuel infrastructure in the Salish Sea. We need the people around the Salish Sea to demand their municipal councils take the first legal steps, to engage with provincial processes, and build continue to build grassroots momentum towards a moratorium. We focus on three areas – Stop the megaprojects, equity and reconciliation for the people in reparations, and we come together to build a better tomorrow. Can we count on you to join our community to yours?